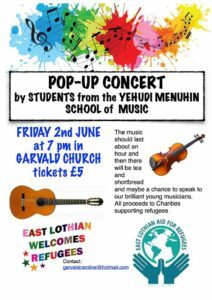 A reminder that Finlay Hay and friends from the Yehudi Menuhin School will be performing at Garvald Church on Friday, 7pm. Contributions of bottles of red or white wine for after-concert refreshments would be most welcome! Please drop off at Lorraine’s (The Beehive), or to Anne at Honeysuckle Cottage. Tickets are £5 on the door, or from Caroline McGregor. All proceeds will go to two charities doing wonderful work to support refugees in East Lothian: ‘East Lothian Aid for Refugees’, and ‘East Lothian Welcomes Refugees’. This entry was posted in Church, Events, Fundraisers on May 31, 2017 by Admin.